Rep. Alexandria Ocasio-Cortez (D., NY) linked Israeli prime minister Benjamin Netanyahu's reelection to "the ascent of authoritarianism across the world," and suggested the United States should consider reducing military and economic aid to Israel during an appearance on the Skullduggery podcast on Sunday. "Prime Minister Netanyahu was just apparently reelected in Israel right after saying he intended to annex the Jewish settlements on the West Bank. Do you believe this should affect U.S. policy to the state of Israel?" co-host Michael Isikoff asked. "I think so," Ocasio-Cortez responded. 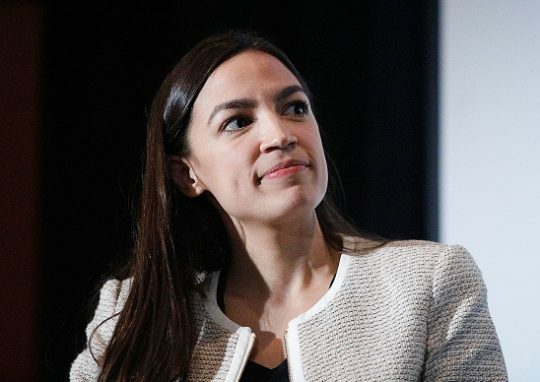 "I think these are part of conversations we are having in our caucus, but I think what we're really seeing is the ascent of authoritarianism across the world," Ocasio-Cortez said. "I think that Netanyahu is a Trump-like figure, and I think that we—there are so many ways to approach this issue. Betty McCollum even has a proposal that she's advanced asking the us not to fund child detention, Israeli child detention of Palestinian children. There's different ways to signal it. I would hope and wish that a diplomatic approach could impact policy. It doesn't all have to be legislative. but I think if we just sit on our hands—"
"Would you be in favor of reducing military or economic aid to Israel?" co-host Daniel Klaidman asked. "I mean, I think it's on the table. I think it's certainly on the table, and I think it's something that can be discussed," she said. "And I think that—and I also acknowledge my role in in this as well in that I hope to play a facilitating role in this conversation and a supportive role in this conversation, but I also know there are people that have been leading on this for a long time like Congresswoman McCollum." "But I think that we need to expand what those policy conversations are because I would—as just a citizen of this country—I would be very concerned if Trump started really pursuing more and more and more increasingly dangerous policies, and everyone just standing aside saying this is normal," she said. Ocasio-Cortez struggled to address questions related to Israel while running for Congress last summer, admitting in one interview she is "not an expert" while also defending comments where she accused the Israeli military of a Palestinian "massacre." She also backed off her support for a two-state solution within three days of calling herself "a proponent of a two-state solution." This entry was posted in Politics and tagged Alexandria Ocasio-Cortez, Anti-Semitism, Benjamin Netanyahu, Israel. Bookmark the permalink.